WPLift / WordPress Plugins / Email Marketing / Campaign Monitor vs. Mailchimp vs. SendinBlue: Which to Choose? So you’ve finally decided to get serious and start building an email list. Congrats! You’re on your way to building an evergreen resource that will never go out of style. But now you’ve stumbled into a difficult decision. There are a million and one email marketing services out there – how the heck can you pick between them? I know the feeling. Trust me. I’ve bounced around my share of email marketing services. I’ve gone with Mailchimp, SendinBlue, MailerLite…you name it. So today, I’m going to try to help you out. While I can’t look at every email marketing service out there (sorry! There’s only so much time in a day), I will be taking a deeper look at three of them: Campaign Monitor vs. Mailchimp vs. SendinBlue. What kind of automation do you need? Are you just sending autoresponders or do you need advanced triggers for lifecycle emails? Do you need specific integrations? For example, if you need to send transactional emails for WooCommerce, make sure that your service can do that. Does it have A/B testing? If you want to optimize your emails, make sure you preferred service offers A/B testing. Do you want to pay per subscriber or per email? Some services charge based on how large your list is and some charge based on the number of emails that you send. Does it integrate well with WordPress? Since you’re on this site, there’s a good chance that you use WordPress. *there is technically a free plan that allows up to 5 subscribers…but that’s really only useful for testing the tool. Though it’s the only service on this list which lacks a free version, Campaign Monitor is affordably priced and has a user friendly interface. 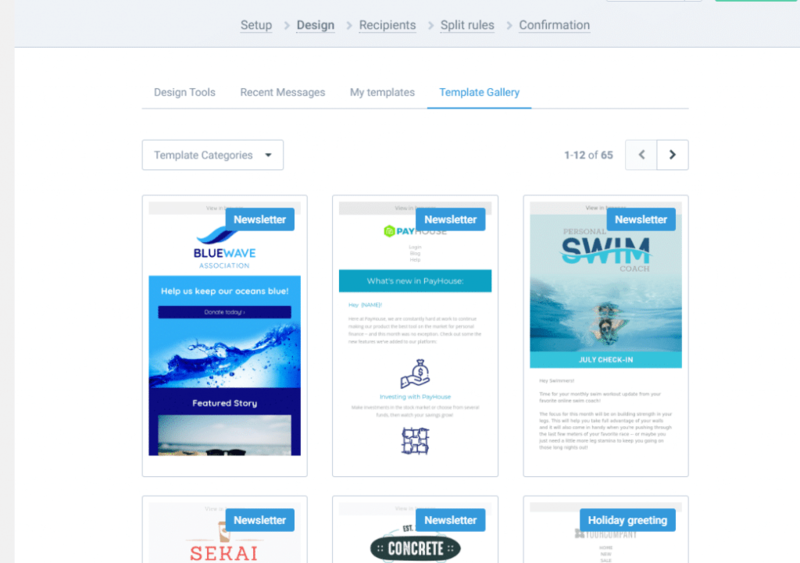 When you create a new campaign, you can choose from a number of modern email templates. Of course, if templates aren’t your thing, you can always create your own from scratch. Overall, the Campaign Monitor email creation interface is quite simple. Classic Transactional Emails – send standard transactional via API or SMTP. Smart Transactional Emails – send emails based on specific triggers that you can define. Great for optimizing your email campaigns. Campaign Monitor lets you create something called Journeys. Journeys are basically autoresponder campaigns. BUT, you can change the sequence of emails a user receives based on their actions. 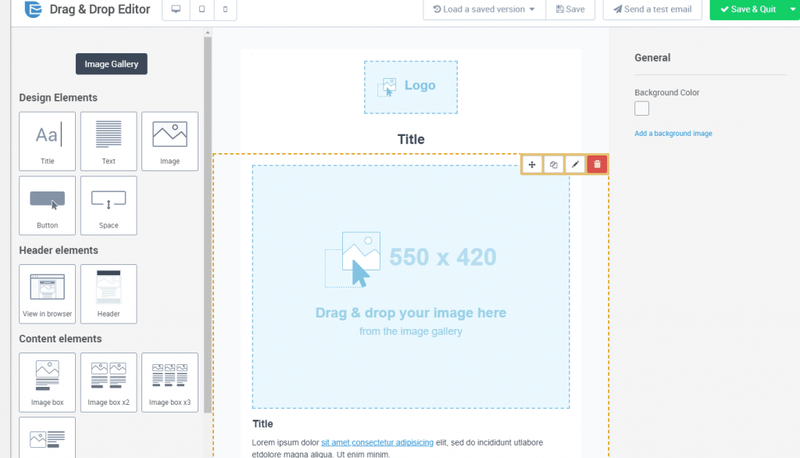 So you can actually use it to create your very own lifecycle email campaign. In total, Campaign Monitor offers over 250 different integrations. These include dedicated a plugin for WordPress that helps you create signup forms tied to Campaign Monitor and A/B test those forms to optimize their performance. As I mentioned, Campaign Monitor lacks a free version. Their cheapest plan starts at $9 per month and allows you to send 2,500 emails to up to 500 people. If you want unlimited emails and full features for those 500 subscribers, you’ll need the $29 per month Unlimited plan. Prices go up from there. I’m a big fan of Mailchimp because I think that its free plan makes it easy for beginners to get a taste of email marketing. It’s got everything you need to send newsletters and autoresponder campaigns. Like Campaign Monitor, Mailchimp includes tons of email templates so that you can create beautiful emails whether or not you have any design talent. While you can do all of this with both of the other tools as well, I don’t think either of them are as user-friendly as Mailchimp is. So for automation, I give the edge to Mailchimp for usability, though not for raw functionality. Like both other services, Mailchimp gives you plugins to help with WordPress integration. They include both a general WordPress plugin that helps you set up opt-in forms as well as a dedicated WooCommerce plugin. The dedicated WooCommerce plugin is nice because it makes all of those cool eCommerce automation series easy to implement. 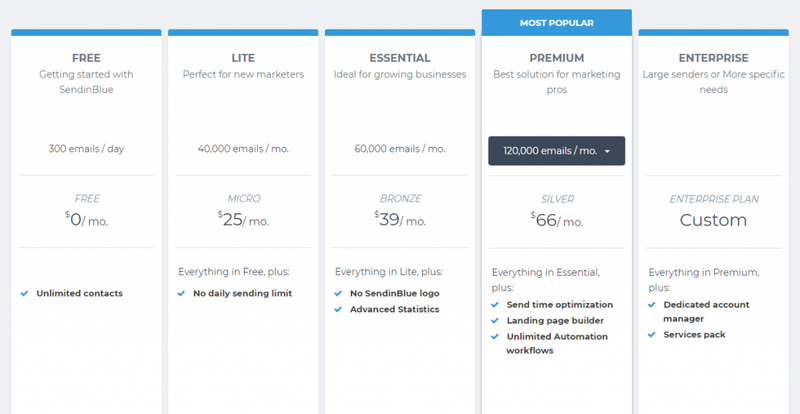 You can quickly set up abandon cart emails, recommend new products, and lots more. Unlike Campaign Monitor, Mailchimp does offer a free plan. You can send up to 12,000 emails to 2,000 subscribers per month for free, though you won’t have access to all features. Full-featured plans start at as little as $10 per month for 0-500 subscribers and unlimited emails. Like Campaign Monitor, Mailchimp charges you by the number of subscribers you have, not the number of emails that you send. As you’ll see in the next section, SendinBlue is unique in that they only charge you for the actual number of emails that you send. SendinBlue is unique in that they have, by far, the most full-featured WordPress plugin of any service on this list. If you’re a wplift fan, you may remember that I reviewed the SendinBlue WordPress plugin previously. It lets you pretty much manage all of your email marketing tasks from directly inside your WordPress dashboard. So if you’re a WordPress user, that’s a pretty big plus. They also have a dedicated WooCommerce integration. Because the SendinBlue WordPress plugin is very feature rich, it’s quite easy to set up automation and transactional emails for your WordPress site. Beyond the drag-and-drop builder, you can also use a more lightweight visual text editor or paste in your own HTML code. One area where SendinBlue really shines is the ease of adding marketing automation to WordPress. 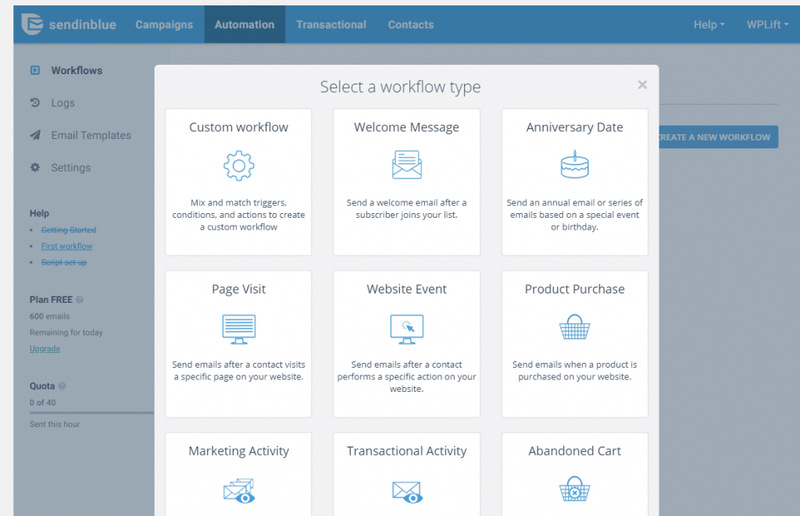 While I like Mailchimp’s automation tools in general, SendinBlue has the best application of marketing automation for WordPress. See, all you need to do is hit a button in the SendinBlue WordPress plugin and it will instantly set up all the tracking needed for full-scale marketing automation. If you’re a WordPress user, it’s absolutely the easiest way to get started with marketing automation. Unlike the other two options, SendinBlue charges you by the actual number of emails that you send, rather than the number of subscribers that you have. Depending on your usage, this might be more affordable. Or, it could also cost a little more – it really depends on how you use it. With their free plan, you can have unlimited contacts and send up to 300 emails per day (so ~9,000 per month). Which Email Marketing Service Should You Choose? When I first wrote this post, my overall favorite was Mailchimp because I felt that they had the easiest interface to use. But, as of my most recent update in December 2018, SendinBlue has closed the gap with some recent updates to their interface. So if the idea of keeping everything contained within your WordPress dashboard is appealing, then you might want to go with SendinBlue instead. While I do like Campaign Monitor, I couldn’t find any real reason to choose it over Mailchimp or SendinBlue, at least based on my uses. Campaign Monitor does some interesting things when it comes to automation and personalization, but those features are only helpful if you’re willing to put in the work to set them up. If that sounds like you, Campaign Monitor might be worth considering. Otherwise, I’d stick with SendinBlue or Mailchimp. Which is your favorite out of these three services? Let me know in the comments! Big difference between Sendinblue and others is pricing for number of subscriber. if you have more than 2000 subscribers, Mailchimp costs a lot immediately. In that case I definitely go Seninblue. Sendinblue, Mailjet and Elastic Mail is the one for who have a lot of subscriber. Other services are too expensive. most small businesses owners don’t want to use it. With the unique combination of all three attending an entrepreneurship class together, all coming from first generation immigrant parents who started their own businesses, the three had the perfect background to strike out with a business venture of their own. Utilize Insightful Reporting and Analytics. Their paid email marketing service starts at $20 per month for unlimited emails up to 1001-1500 subscribers, and it increases $5 per month for every 500 subscribers added. All paid plans have unlimited email sending capabilities throughout the month. You have a great article you have covered almost all the important topic.